"Hello Barbara! I just wanted to send you the link to my company's website . . . and say thank you again-without your wonderful training and guidance, I don't know if I would've gotten to this point! I officially opened for business yesterday, and through word of mouth I have 2 appointments booked for this week, and a presentation booked for next week with a new real estate company! - Shelly Landry"
"Anyway, I have been reading the manual and although I am pretty confident with my limited decorating abilities, it is great to know that i am on the right track. I can't put it down!! If I had discovered your website earlier, I could have saved myself a whole bunch of $$. . . . I can't believe that you would have time to write that incredible manual and still do all the other stuff!! - JOY"
"You'll actually have to evaluate each and every idea and concept independently and make some hard choices on the ones that will be right for you, letting the others fall by the wayside temporarily because there simply aren't enough hours in the day to do everything. But instead of buying each part of my full training program one at a time, you can now get everything you need all at once in my diamond program that gives you extra free bonuses, saves you time and saves you money too - and is loaded with tools of the trade, many of which are totally exclusive. "I received yesterday my Diamond Program so I also downloaded the eBook. Wow! I am sooo pleased! I have learned more in one evening, night and this morning (needless to say I got only 4 hours sleep) than I have in many, many hours of design classes! I paged through everything very quickly, reading snip here and there. Despite having worked for 7 1/2 years as a cabinet/closet/storage/kitchen designer I realize now I have only been touching the tip of the iceberg of what I could and should be doing to capitalize on my talents. I can't wait to read more! I'll let you know how my appointment goes. With much thanks, Mary Margaret Connolly"
"Well, if someone needs "proof" that this stuff works...it happened here folks! Barbara, as I mentioned the "whooper house" had been on the market 9 months and needed to sell in 5 weeks or the owner was going to loose her new house that is being built. In that 9 months, I did found out there had been one flimsy offer and financing didn't go through. I staged the home Friday afternoon getting it ready for the first of 5 open house Sundays. . . . Saturday afternoon an outside realtor unexpectedly called to see the house. Her clients were relatively sure they were going to put a bid on another house but were willing to look at one more house. The house wowed them and they wrote up a contract that afternoon on this house...!!!! UNBELIEVABLE. "I wanted to let you know that I have been slowly delving into the course work (and really enjoying it!) to begin my own business. I have been a teacher for 28 years and just had enough. I've had a passion for interior design for most of my life, and just felt it was time to take the plunge - so at the end of the school year, I resigned from teaching and am hoping to get my business going by September. I am continually awed by the depth of your website and business in general. There isn't anything that I can't find with the click of a mouse... the information is endless. I am very impressed with the business you have built and what you are willing to share with your "students". Thank you for being so thorough; it is a great help to people like me who are fist timers. - Marylou Pritchard"
"I have now completed all the manuals for the course . . . I must say that I am absolutely overwhelmed (in a good way) with the information that I have absorbed throughout your Gold Program, it was way more than I expected. I definitely got my monies worth. One other thing I would like to thank you for is Chapter 25 of Decor Secrets Revealed, your eBook. I am not an extremely religious person, but I cannot tell you how important that chapter was to me at the time in my life in which I read it. Your words helped me to make one of the most difficult decisions in my life, it really hit home. It made me focus of the most important members of my family - my husband and children. For twenty years my husband and I allowed our extended family to run our lives in a way that made us compromise our lives and our children's lives as well as our beliefs. Chapter 25 allowed me to re-focus what was most important in my life and I re-read it on a regular basis to make sure that I don't forget it. Isn't it funny how your words about a subject (decorating) that is such a passion for me, could change my life forever. Again, I cannot thank-you enough. Again thanks for replying so quickly and look forward to your reply. Thanks, Judi L."
"Barb, I just couldn't wait to tell you how excited and ecstatic I was to receive all of you're e-books and printed books. They were sensational; easy to read and understand, filled with personal stories and experiences, and full of valuable information. Most of all the personal support I received everytime I called. You were always there. Thanks for brightening up my world with you're redesign and decorating techniques. Judes Ziemba"
"I basically just switched the dining table with the black chairs to make a cozy conversation area at the end of the room and put the dining table in the front of the room off the kitchen bar. Then, of course, “shopped” within her house to find accessories and artwork to create a more pulled together look. I suggested painting the dining chairs black for a bit more contrast. My client loves the new look and hired me to do the rest of her house with which we are almost finished. The entire house is coming together beautifully. Thank you for all your training, newsletters, and support! - Sharyn Hutchinson"
"Dear Barbra, Sorry that I haven't written to you sooner, but we got home from vacation about a week ago. When I got home a was so anxious to get started. I love everything that I purchase from the Diamond combo training. I was so excited to start and I have already finish reading the Decor Secrets, Great Parties! 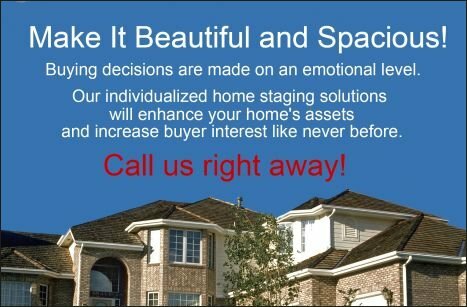 Great Homes, Where's there's a wall there's a way and the Home Staging. Your training books are so good that every time that I started reading one page I couldn't wait to read the next one. There's so many wonderful idea's. I have learn so much already and I'm anxious now to start my next training book and home enhancement CD's. It was way more than than I expected. I was love my designer bag, the 3 room files with the magnetic sheet for the floor plan and also the file holder. The diamond combo is well worth my money. Well, I better go now and start reading. God bless and have a great day. Lisa Berge"
You don't get many chances to genuinely help other people, enjoy your creative skills at work and make a lucrative, independent living all at the same time. But that's just what I've been doing for the past two decades and I can teach you how to do what I've done. Let Me Illustrate . . . Recently I helped a lady who lost her daughter to leukemia and then suffered through a divorce. She had brought her home furnishings into her new home and needed help making everything look and feel like home. It was my great honor to work with her all day to rearrange her living room furniture and accessories and create a more attractive bedroom. I even listened for an hour to the story of her daughter's fight for life. When does one get the chance to decorate for another person, make a home beautiful and comfortable and lend a sympathetic ear to someone who needed to share one of life's hardest battles - the loss of a child? Then there was the superior court judge who remarried a young journalist and the two were struggling to "marry" two completely different household styles together under one roof. How much fun is was to work side by side with the "bride" to create an oasis of love, comfort and beautify for both husband and wife to enjoy. And how great it was to help the middle income family whose father had been promoted to another position in another state. They desperately needed to sell their home and get settled before school started again. To be able to advise them on the furnishings that had to be edited out of the home, reorganize what was left, make some minor repairs and add some fun enhancement strategies was right down my alley. But there was nothing quite as satisfying as seeing the joy on their faces when their home sold right away for more than the asking price. Does This Type of Career Appeal to You? In the last year the home staging and interior redesign industries have grown with leaps and bounds. More and more TV shows have sprung up. So have multiple books and courses. 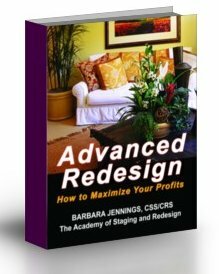 I actually wrote and offered the first one on doing staging and redesign as a business. My goal was to give readers a clear picture of what needs to be done to build a strong, viable business that will not only make money today but that will endure the test of time. But after 6 years of development, I have put together what I know to be the most comprehensive course available anywhere - far superior to all others and more affordable too. NOTE: We reserve the right to change the contents and pricing without notice. Some items included are not shown in the picture. Some books and CDs may have a different cover but the contents are the same. Shopping cart always has up-to-date pricing and contents. Let me remind you: You don't need a degree. You don't need to be certified. You don't need to be connected to anyone or anything! You just need to be well grounded in the basics of re-design and staging and then plunge right in. You'll have so many tools at your disposal, I guarantee you that you'll have a hard time focusing in at first. But these will totally equip you and make you feel terrific. And feeling terrific and confident is what it's all about. When people see you confidence, see how you handle yourself, they will feel reassured that you can really help them - and do it right the first time. TESTIMONIAL - "I was working with one home, and when I was looking to rent furniture the person at the place of my choosing asked where I was getting my certification from. After I mentioned your name and program, she said that she has worked with 2 other individuals from your program. And, she thought very highly of the work being done by these people. Just thought you'd like to know that! Have a great Labor Day weekend! 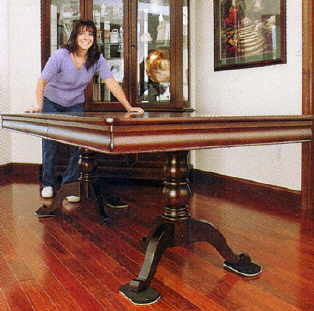 Debi Wheatley"
Where to Place the Major Furniture - What Is the Major Furniture? Chapter One discusses who the affluent are and defines them for you. You'll learn where the largest concentration exists, 4 distinctive ways they got wealthy. Chapter Two will teach you how they think, how they work, what motivates them, why they become dissatisfied. Chapter Three gives you the six main methods of making contact with the affluent. Chapter Four teaches you 12 dynamite ways to meet wealthy prospects, and gives you the keys to 33 highly targeted women's associations where you can become known and valued by thousands and thousands of high income prospective clients. And that's not all. You'll be taught 9 different ways you can structure your business to capitalize on these highly prized relationships, plus you'll learn about the 12 rules for governing your professional conduct to ensure your success. Chapter Five will teach you the differences between quality prospects and the rest, the secrets to what drives their decisions, how presenting your services to them needs to be different from the main stream prospect, the 3 critical aspects you absolutely must give them. Chapter Six identifies the essential ingredients necessary for getting a relationship started, 14 steps that move you in the right direction, another 10 to take as you progress, 12 things they need from you in order to trust you, 4 styles of operating that will make them respect you professionally, when/what and how to ask for what you want, and so much more. Chapter Seven deals with your appearance, etiquette, image, wardrobe, first impressions, vocabulary, plus a lengthy segment on how to attract the affluent. I break it all down for you with lots of strategies and concepts and tactics, even great to use for other types of clients and prospects. Chapter Eight focuses your attention on how to sell to affluent prospects, developing your personal Credo, 12 all important tenets you should make part of your overall motto and philosophy, 9 killer ways to reach out to prospects, and page after page of other helpful tips. Chapter Nine is all about pricing, how it differs or doesn't from the mainstream, how to simplify giving quotes that take the guess work out of options. Chapter Ten covers how to service wealthy clients and gives you some examples of where some companies have missed the mark totally, so you don't fall into those traps, including a detailed Credo tailored for the upscale market adapted from one of the most well-known service oriented mega corporations on the planet who rose to prominence on the commitment to their Service Creed. Chapter Eleven discusses the pseudo-affluent, how to recognize them and avoid them. Chapter Twelve teaches you 7 key elements on how to become a member of the affluent society in your area. Motivational, if I do say so myself. Chapter Thirteen is a complete checklist of specific steps you need to take on a daily basis, 37 things you must do, 43 things you must not do, managing the Monday Morning Blues and a whole lot more. I know it seems like a short list, but that's because I've grouped my top ten strategies together at the end (I devote a full chapter to each one). I don't want you to prejudge anything and I certainly don't want the competition to learn what you'll be learning. Besides, you need to read about them in detail to capture what I'm saying and I won't say anything more about them here. But if you've already taken training from me you know that I'm pretty thorough and I give you plenty of information, lots of tips, tried and true procedures and ideas. I've been doing this a long time and I've gleaned lots of ideas from other successful re-designers and stagers as well, and organized them into a powerful guide. I will be the first to admit to you that even I have not done everything I'll be teaching you. As I said, there isn't time enough to do everything and do it justice. But I've done most of the strategies myself and I can attest to their integrity and the mega profits they can generate for you. And Yet, There's More - 189 Pages to Start With! I've compiled the world's only illustrated furniture arrangement training that is so easy to follow you'll actually be amazed with how easy it is to learn the concepts that professional interior designers use to arrange furniture and accessories. Arrange Your Stuff (189 pages) goes hand in hand with my eBook, Decor Secrets Revealed. But Arrange Your Stuff approaches the concept from a completely different angle to give you the absolute best of both worlds. I'm not satisfied with mediocre results. As good as my training program has been so far, there's always room for improvement -- there's always new approaches to the subject that can help you understand once and for all the all-essential concepts that you need to know thoroughly if you expect to be wildly successful in a redesign business. I guarantee you, that if you learn the basic concepts I've laid out for you, that you'll be able to successfully arrange any room in your house, any house, any time, anywhere, no matter what you own, for the rest of your life! How can I be so sure? Because the design principles you will learn have been used by interior designers for decades and they will be the same concepts used for decades to come - no, for centuries to come. You see, while styles change and color trends come and go, the arrangements concepts last forever! So once you know them and understand them, you'll be about to successfully arrange any room at any time for as long as you live. How great is that? There has never been a book like this published by anyone anywhere at any time! Just look at some of the pages in this 189 page manual (8-1/2x11 size, comb binding). And when you couple this manual with my very exclusive and thorough eBook, Decor Secrets Revealed, you will literally be blown out of the water on the thoroughness of the training you will receive. Decor Secrets is sold separately on this website and comes exclusively as an electronic book, which you would read on your computer. Here are two examples of some of the pages in the manual. As you can see, there are illustrated drawings of the rooms, together with my handwritten notes to direct your attention to specific issues that this room presented. Below the drawings are easy to understand explanations of the specific problems faced for that room, followed by drawings of how I rearranged each room. In many cases, I'll give you 2-6 arrangements of the same room so it will be easy for you to see the concepts being applied. You see, with most rooms, there are several different ways the room can be arranged successfully. By showing you these differing arrangements, you'll easily understand the concepts used. You'll never look at a room in your home the same way again and you won't ever feel like it has to remain arranged in just one way for the rest of your life. You'll begin to see the multitude of solutions you can apply to change the room periodically for a whole new feeling. OR NOT AS YOU CHOOSE. That's right - you submit the details and we'll put up a SEMI-CUSTOM BROCHURE WEBSITE in the domain name of your choice (so long as it is available) so you can have an instant professionally designed internet extension and direct realtors and clients to your online presence. If you already have official website (not hosted by a competing trainer), just let us know and we'll link to your official site from the The Academy of Staging and Redesign - Directory, the fastest growing directory of its kind. Some people get calls instantly, even before their training materials arrive. And the visitors to this directory is growing every day. This way we will instantly help you brand your business and get out your message by the time you finish training. Inclusion in our Membership Site which includes even more online training, how-to videos, forms and additional resources to help you brand, build, promote, advertise and manage your growing business ongoing. We stay on top of what's happening in the industry and continously develop products and services that will help you enhance your business to make the most profits you can. It's not about starting a business; it's about growing it and sustaining it for as long as you want to be in business. A recent encounter with a woman who described herself as an "old jaded designer", who had switched from full service interior design to one day decorating, is evidence that even those who may have been successful in the past need to keep up with the paradigm shifts in business and how it is done today or be left behind. We will help you sustain your business for the long term. 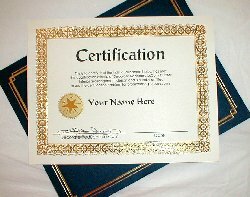 To help you with credentials that have meaning and power, we've created our own certification program. In the Diamond Standard Course you'll be qualified to earn certification in both businesses and become a Certified Staging Specialist (CSS) and Certified Redesign Specialist (CRS). We're not like the high priced seminars who will give you a designation of some kind just for attending a seminar. That's pretty meaningless to most prospects you'll talk to later when you're trying to compete in the marketplace. We'll train you so you'll be able to pass our no-time-limit, open book exam and submit your beginning portfolio of work you've done early on to make sure you're operating at a professional level to ensure your success out in the field. Portfolio examples do not have to be paid projects - we just want to see you at work out in homes. It does you no good whatsoever to lack the ability to articulate design principles you need to know and it does you no good whatsoever to do inferior work because of lack of proper preparation and oversight. When you complete our program, you'll have attained a much higher level of sophistication and expertise and be entitled to promote yourself as a CSS/CRS professional. And did you notice we said "guaranteed" certification. As a Diamond Standard trainee, we'll help you through the process if you're struggling. We can therefore guarantee you'll pass. Not everyone does when they apply for it "a la carte". But by going "Diamond", we'll help you attain this achievement as we want you to succeed, but we want your success to have marketable strength. Anything less may be unprofessional and we want all our designees to enjoy superior talents in the industry. You'll gain access to our list of companies where you can get up to 50% off (sometimes more) of products and services for your business and personal needs. You'll gain access to companies who can provide legal forms, legal advice and liability insurance for your business. in Microsoft Word or a text editor of your choice. If you need help setting up your business and choosing the right legal entity (S-Corp, C-Corp, LLC, Sole Proprietorship), and you need help with your tax returns, we've got a top CPA (Certified Public Accountant) to give you discounted services. Learn the tricks of the trade that magazine stylists use to enhance their photographs and draw the reader into the ambience of the room. Beat your competition with your stunning portfolio of unmatched superior quality, style and beauty. to spark your own creativity. The time is right! The opportunity has never been better! But those that get in on the lucrative home staging, house fluffing, home enhancement, interior redesign, one day decorating business early are the ones that will reap the largest rewards. Two of my training manuals alone equal 367 pages of hard-core redesign strategies, concepts, ideas, how to instructions alone. That's just for starters. One book gives you 101 illustrations of wall grouping design, from the simple to the complex, from two companions all the way up to gallery walls. Now I've just added another 189 pages of incredible, easy to follow, easy to understand training on furniture arrangement concepts that virtually take you inside my mind and teach you how I dissect every room to maximize my client's furniture in the most appealing manner. My staging tutorial is currently running 216 pages, meaty stuff. Just imagine yourself having a hefty bank balance at the end of the month to carry forward. Imagine yourself working smarter and not harder. Imagine yourself having time to treat yourself to a luxurious vacation. Imagine yourself going into a store and not having to look at the price tag before buying what you like. Your own SEMI-CUSTOM BROCHURE WEBSITE ABOUT YOU HOSTED ON OUR SERVER FOR ONE YEAR (RENEWABLE FOR NOMINAL FEE) TO JUMP START YOUR BUSINESS - HELPS YOU INSTANTLY BRAND YOUR STYLE AND MARKETING MESSAGES AND MAKES IT POSSIBLE FOR PEOPLE TO FIND YOU ON THE INTERNET DIRECTLY OR BECAUSE OF OUR VISITORS SEARCHING FOR HELP. That's right - you submit the details and we'll put up a brochure website in the domain name of your choice so you can have instant internet exposure and direct realtors and clients to your online presence. Then we'll link to your official site in two of the fastest growing directories on the web: The International Staging and Redesign Directories for double the exposure Sample Page. We advertise these directories every day, spending thousands each month. Many people get contacted before they even finish training. 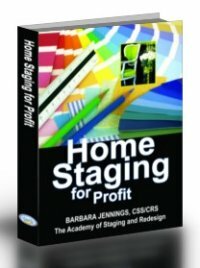 Home Staging for Profit (256 pages) will teach you everything you'll ever need to know about how to start a home staging business for profit. Whether you only want supplemental income, or whether you're looking to build a career, this tutorial covers the whole gambit from how to get clients, how to interview real estate agents, how to interview home sellers, a 25-page checklist to guide you and which you can even give out as part of your consultation and so much more I can't list it all here. 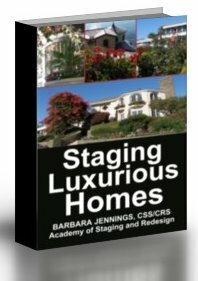 Staging Luxurious Homes (232 pages) is my newest, exclusive, one-of-a-kind training on how to find, attract, sell to, service and build a large list of wealthy clients. 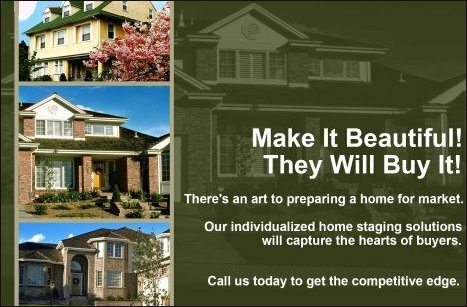 Upscale homeowners have no problem coming up with the money to hire you and because they live high stress lives, are only too happy to have someone handle all of the staging procedures for them. We are the only ones offering this highly intensive, target training. This training is worth the entire cost of the program all by itself. 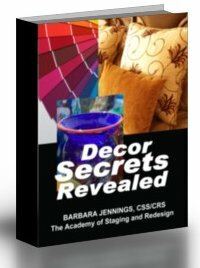 Decor Secrets Revealed (25 chapters/PC compatible) will teach you everything you'll ever need to know about furniture arrangement and accessory arrangement techniques. These are the core design building blocks you will need to be successful as a redesigner. Even if you've had some formal interior design training before, you should take this training to fortify yourself and serve as a reminder. I've even had other people tell me they learned more from me in this one eBook on arrangement concepts than they did in all of their formal design classes in college. Arrange Your Stuff! (189 pages) will teach you virtually everything you need to know to successfully break down a room to it's bare essentials, pinpoint the natural and architectural focal points, analyze the traffic patterns, nail down the major problems the client has been facing, and develop a design plan that will be perfect, not only in functionality but in appearance. You'll truly be equipped to take virtually any room, with any given set of furniture and accessories, and turn it into a "designer's showplace", just by how you arrange what the client already owns. This manual is a one-of-a-kind. No one has done this before. Rearrange It! 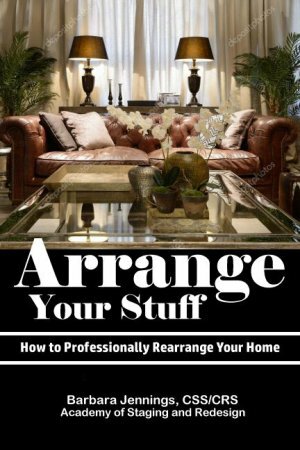 (176 pages) will teach you everything you need to know to successfully do basic redesign, where you go into a client's home and professionally arrange the furniture and accessories they already own. It goes into all of the business how-to that will help you organize your business, market it, manage it and grow it. I will be sending you the download instructions for Decor Secrets Revealed immediately, and you can study that while you're waiting for the rest of the course to arrive by UPS. Rearrange It!, then, should be the first training manual you study when your whole course arrives. Next you'll want to immerse yourself in the extra techniques in Advanced Redesign (200 pages) training, where you'll immediately learn more basic strategies, but a whole lot more - 10 unique strategies that will help you take your business to the level you probably really want it to go to. No one else offers you this kind of advanced training. After that, you should learn the professional techniques that professional installers use to mount any wall art, mirror, shelf and so on. You'll be faced with clients that have lots of small art and family photographs which you must arrange into beautiful, striking wall groupings. You need professional techniques to do those quickly and effortlessly. I know you'll be raring to go as soon as possible and start having fun in your new business venture. So to help you here, I've put together a Musical CD Slideshow of 140 slides of some of our before and after pictures to help you until you get some of your own. A picture is worth a thousand words, so our CD is worth 140,000 words. What better way to show your prospects exactly the kind of dramatic improvement a professional redesign can do for them. You'll get one of these to get you started quickly and easily. Don't worry about what you'll say to people - just let them see the slideshow and it'll do most of the "selling" for you. You can always order more through our a la carte program too. Don't try to tell sellers what home staging is all about. 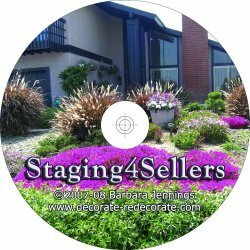 Show them using our 121 slide home staging musical slideshow CD that features before and after pictures of home that have been successfully staged for sale all across the country. It also clearly points out the benefits of hiring a professional stager like you. It's great for when you're new and you don't have any pictures of your own. 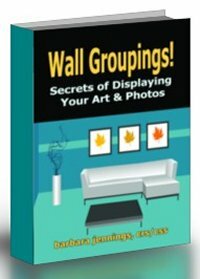 You'll also get a copy of my softcover book, Wall Groupings: The Art of Arranging Art and Photos. This breezy manual included 101 illustrations of wallgroupings, from the simple to the complex, to train you properly on designing wallgroupings for clients. You'll love the training you'll get in this one of a kind book exclusively offered here. Don't forget the handy furniture sliders (set of 4) that make moving heavy furniture across carpet super easy. I'm also including a set of 4 furniture sliders for use on hard floors, such as hardwood, tile, vinyl and so forth, as well as the steel furniture lifter to help you easily move any piece of furniture, no matter how heavy, all by yourself if need be. Next I'm also including a set of custom designed stationery for you: 500 business cards and 200 announcement cards. All elements of your Stationery Pak are designed to match and will include all of your personal contact information. With several styles to choose from, you'll have the look you want right off the bat. Flower Power (15 chapters) is an electronic book that will teach you all of the secrets of how to create beautiful flower arrangements so you can custom design them for your clients as an added bonus to augment your other services. No Wait! This Still Isn't All . . .
You'll also begin your road to Certification, and not just certification in one business, but guaranteed certification in BOTH businesses (redesign & staging), which I also offer here. But instead of going through the process with a chance to fail, we guarantee you that you won't fail. We won't let you. We'll work with you as long as it takes to ensure you reach a level of competency where you will be certified to offer talented redesign services and home staging services to your clients. You'll still have to go thru the process, but we'll help you with extra training if you need it, to assist you in any way possible to achieve that level (VALUE: $1500 - If we have to work more with you to guarantee your success). You'll also get a list of 419+ Redesign/Staging Business Names (VALUE$ 59.95). Pick one and use it (after checking with your county Fictitious Business Name department to make sure it isn't already in use in your county). Or use the list to trigger an idea for your own unique business name. And you'll get all of the regular free bonuses and the monthly business newsletter promised elsewhere on this site, PLUS a free copy of the current Color Trends Report ($29.95 value). And let's not forget to extremely valuable ability to write to me or call me for personalized, on-going help any time you need it. There will never be any additional charge for this mentoring program. You get the personal help of a world class redesign trainer at your fingertips. I'm available by email at any time and you can even call me and get me. So you can't lose, so long as you are willing to learn and you actively following the instructions and directions and guidance we provide for you. You could be advancing your business in about 5 minutes from now by ordering your Diamond Deluxe Combo Training Program online right now. Get it all now - or get it slowly by going back to our home page and going to each individual training program one by one. You'll first receive your download instructions for Decor Secrets Revealed so you can start your training immediately. You'll download this product and read on your computer. It only comes as an eBook. While you're working your way through the design training in this eBook, we'll be processing the rest of your order and getting it off to you by UPS by the next business day. By the time you finish training in the design concepts, you should be receiving all the rest of your materials. Full instructions will come as to how to access the free bonuses as well. BONUS 1 You will be given my private email address so that you can ask me questions that pertain to your own situation. We'll even talk about your business by phone. You'll be able to have me help you personally whenever you need it in a more personalized way. Two clients will make you back more than enough to cover your entire training program - so how good is that? You'd have to get a lot of clients to recover from the high priced seminars out there. If you paid me privately, it would cost you $10,000 and be a great investment for your business. But I promise I will be here long term to help you. I consider this your Success Insurance if you use it properly. You get to pose questions. You get to submit ideas. You get to say, "Hey, this is how it has worked" or "It's not working. How can you help me?" My competition mostly runs out on you after the seminar. I'm quite the opposite. I want to ground you. I want to develop you. I want to instill my mindset in you. This is priceless. You'll also get my monthly Business Building Newsletter, that is filled each month with additional training to help you build your business to the level you want it. I include my own personal experiences, tips and tactics and strategies for marketing and promoting your products and services. I put a lot of time and energy into my newsletters. I make myself available to you by phone and email too. People are often very surprised when they call and find that I answered the phone. Why do I answer the phone instead of a staff member? Because I want to be accessible to you. I want you to know that it's pretty easy to reach me - at least it is right now. You can't sign up for this newsletter. You have to qualify to get it by becoming a trainee. Whenever I have someone write or call me for help, and it's not possible for me to serve them because of my schedule or distance from my office, I always look to my list of Diamond Trainees and give my referral to them to handle. I can't promise I'll have referrals for you, but I do give out many referrals every month and the Diamond Redesign/Staging trainees are the benefactors of those. As a Diamond Trainee, you will receive referrals from me if (or when) someone contacts me looking for a redesigner/stager in your area. I do not give out referrals to any trainees unless they have gone through the Gold or Diamond Redesign/Staging course. Naturally, if you follow through and submit your full contact information for the Redesign Directory (which you will receive at no additional charge for life), visitors to the Directory will be able to contact you directly. But regardless, I only give out referrals myself to Gold or Diamond Trainees. This is another one of the bonuses you will receive. Is wallpaper worth the cost and effort? So you get all this additional training in party decorating, entertaining and decorating tablescapes, all as an additional bonus for choosing the Diamond Training Program. Quite honestly, no one has covered the subject of redesign this thoroughly - no one. Suffice it to say, this doesn't need to offer a bonus at all, other than to answer any questions you might possibly have when you're done. And that's already promised to you in Bonus #1. But I'm trying to make this training as complete as possible, so you won't be left high and dry ever. People who know, know that having your personal mentor is worth far more than the price of the product itself, because making the application to your personal situation is where the true difficulty lies in learning anything new. But I'll be here for you, advising you and helping you every step of the way, so long as I breathe and you need me. You have my word on that! You do have to work at it, I won't kid you, so if you're lazy, this isn't the training program for you. But if you really want to make top money, if you crave enjoying the peak of success, then this is the right place and the right time. If so, go get your credit card right now and let's get you going. The ordering process is quite simple. You can order your copy through our Secure Server on line and get instructions on how to download it on to your computer in less than 5 minutes, or you can FAX, phone or mail in your order, using the links below. It takes longer that way, but it's up to you. Order now. Cause if you wait, I guarantee you'll never do it and five years from now you'll be regretting it big time as a competitor moves in and takes the business right out from under your nose! Ground floor opportunities don't come along all that often. Redesign is just beginning to really take off. Most people haven't heard of it yet -- but many have. Either way, that's good for you, but only if you act soon. Right now there's very little competition and you can jump in and go! But first you need to learn how from someone who has done it for years! If you're in an area that has competition, you better find out the advanced strategies before your competitors do so you can take over the scene. You definitely want to gain the edge and this is the perfect training program to help you do just that. 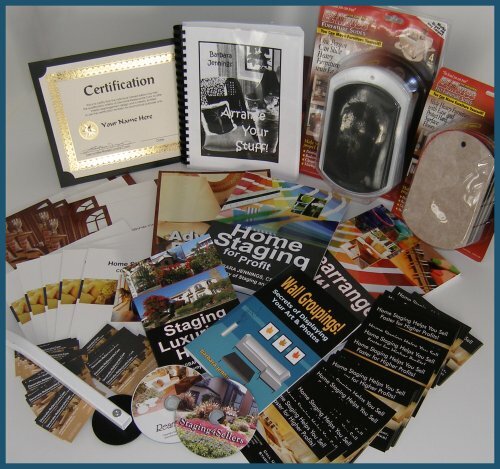 (an instant savings if you were to purchase the items individually, plus you save on shipping charges, can place your order in one convenient step, get guaranteed double certification and a lifetime listing in two International Directories PLUS your own semi-custom website and a complete business stationery package plus lifetime inclusion in the members-only site for on-going training and support. See alternative options for enrolling in one of our Diamond courses: Payment Plan. For your personal library, we give you 3 eBooks and 6 manuals (equivalent to 1400 pages - no one in the industry does as much), all the promotional and management tools you're likely to need, business listings, certification, and website, so there is no stone unturned on any aspect of either business. You could literally pay for the entire course with just two half-day or one full-day client! We give you 3 eBooks and 6 manuals (equivalent to 1400+ pages), all the promotional and management tools you're likely to need, business listings, certification, and website, so there is no stone unturned on any aspect of either business. You could literally pay for the entire course with just two clients or less! Don't forget, you're getting over $399+ in free bonuses too because each product that makes up this package also comes with it's own free bonuses, added to the ones listed above. That's a tremendous bargain (you don't even know yet) considering that you won't find this type of training any where else for any price and you could easily pay several thousand dollars for seminars and classes that don't cover nearly the ground that we do (I know of a training program for stay at home moms that costs over $5000 in Britain). What is it worth to me to learn how to double, triple or maybe even quadruple what I'm now earning? What is it worth to me to leave my competition in the dust? What is it worth to me to become THE HOME STAGER or REDESIGNER in my area that everyone is talking about? 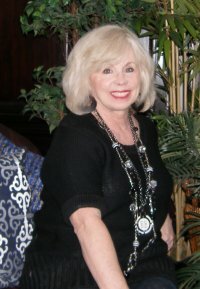 Do I want all the advantages of a true experienced redesign/staging mentor teaching me, who has been doing this business since 1983 or do I want some novice who couldn't as a consultant and decided to try training instead or has only been online a few months trying to copy our program? If you've been considering spending $2000-3500 for a seminar, class or teleconference, you might get decent training (though I've heard many horror stories). How many clients will it reasonably take to recoup your training cost, equipping you in only one business, not two? It will take a few, but it is unrealistic to think you can become professional this quickly without spending some serious money on your business training and tools and web presence. Don't delay as this price may go up at any time. You're not going to find an advanced strategy training on redesign AND staging out there any where, I guarantee it. This is an incredible deal, even at two or three times the price. Our Shopping Cart is hosted at a secure site called Veracart.Com and all information posted is automatically encrypted for your security. You may check the status of their security certificate at any time during the checkout process. Look for the Secure Status Image and click on it. P.S. Remember you're going to get all of my training, and all of my "tools of the trade" in one single, convenient course - PLUS you'll get over $2500's worth of bonuses, guaranteed double certification, your own semi-custom mini website, a lifetime listing in the Academy of Staging and Redesign - Directory and so much more. You won't learn interior redesign and home staging from any other place that is so thorough and affordable that gives you all of the support you'll find here! And as far as support goes, the same day I receive your email with one or more questions, that's the same day you'll get a response back from me, all tailored to your personal situation and at no additional charge. You'll get your own personal mentor and instructor by email. That's my personal promise to you.